What pen and paper offer in flexibility and freedom, though, they take back in access and convenience. I can’t carry all of my old notebooks with me at all times. If I’m at work and want to remember something from a project I worked on a month ago, I’m out of luck—by now, that notebook is tucked away on a shelf behind my desk at home. The go-to solution for a lot of people is Evernote—it’s the darling of most people who want on-the-go access to their information. And it does offer great access to your information from anywhere at any time. However, Evernote has a cumbersome interface for creating new notes compared to the simple, flexible elegance of pen and paper. And entering information directly into Evernote also locks you into a linear, rich-text-based interface—sketches, charts, diagrams and mind maps aren’t an option. There have been a few attempts to marry the flexibility of marking up a sheet of paper with the convenience of on-the-go access to your old notes, but they all fall short. Smart pens, sensor-loaded notebook cases and page scanners all let you still use a pen and paper, and then offer systems for downloading digital copies of each page in your book. But these tools generally require adding too many extra steps to the process between using your notebook and having local, digitized notes. And even when you use them as intended, you still blow through notebook after notebook in quick succession. What we really need is a way to automatically make our hand-written notes and hand-drawn sketches available on the go that doesn’t add extra steps to a workflow. We need a way to build a digital archive of notes and sketches with a process that’s as simple as “Take out your pen and write.” And if we can do it without burning through notebooks, that would be a plus. A month ago, I ordered the Boogie Board Sync, the flagship of Improv Electronics’ “eWriter” line. Improv Electronics’ Boogie Board eWriters are built around a bi-stable LCD display, similar to the Kindle’s e-ink screen. It’s a static physical display rather than a constantly refreshing electronic display, so looking at it is as easy on the eyes as looking at a page in a book. 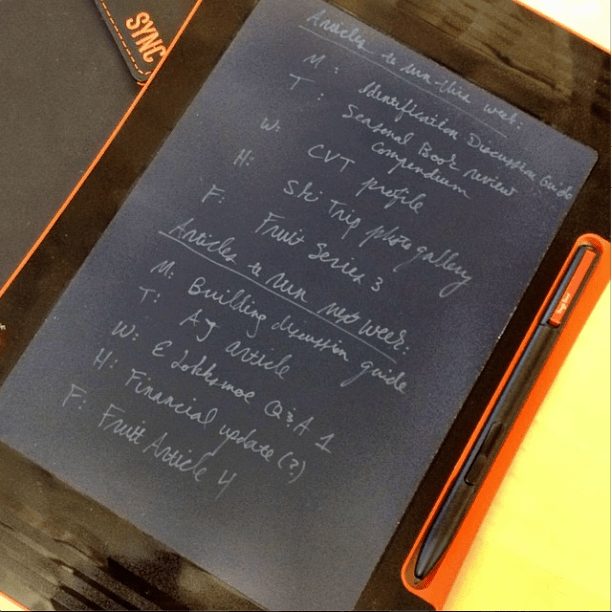 Using a stylus, you sketch or write on the Boogie Board Sync’s e-ink display like it’s a sheet of paper. (Unlike a sheet of paper and because of the current limits of the technology, you’re writing white-on-black instead of black-on-white. Improv Electronics says they’re working on changing that.) When you’re done with a page, you can save it to your Boogie Board Sync’s memory and sync your work to the Boogie Board app on your phone or computer. Syncing your work to the Boogie Board app is the only way you can view a page once it has been saved and cleared off the screen. This is a technical limitation inherent in the type of display technology these devices use. It’s not terribly inconvenient, as I almost always have my iPhone with me, so I can always flip through my recent notes there. You can also easily set your app up to automatically dump all of your Boogie Board notes into a dedicated folder on Evernote, essentially creating a virtual Moleskine that you can access from anywhere. Trying out new technology is often difficult—just dabbling in something new is often a guarantee that you’ll end up clinging to the old out of inertia. So when my Boogie Board arrived, I told myself that I’d give it a fair shot by putting my Moleskine away and going a full week using the Boogie Board 100% in place of my normal legal pads and notebooks. A month later I still haven’t touched a legal pad or a Moleskine again. I haven’t felt like I’m this deep into the future since the first time I used an iPhone. What’s Great About the Boogie Board? When I first took the Sync out of its box, I thought that the form factor would bother me: The bezel seemed larger than it needed to be and its gentle curves could have risked making it unsuitable for professional settings. But it turns out that when you hold the device one-handed, the scalloped bezel hugs your palm and arm like a painter’s pallet. This frees you from the need to either have a stiff-backed notebook or else always be near a flat surface to write or sketch. Jotting notes in bed or doing quick sketches on an elevator has become easy and comfortable. Writing on a Boogie Board Sync is a really tactile experience, albeit slightly smoother than pen on paper, somewhat like using a ballpoint pen on an acetate. Because you are making strokes on the page through a physical process rather than an electronic one, the page is perfectly responsive to your pen: Your strokes get heavier and thicker as you increase pressure. Unlike with the host of handwriting apps on the iPhone and iPad, there is no lag between making the stroke and having it appear on the screen. Anyone who cherishes the physical sensation of pen on paper (or who cares about the fact that writing longhand engages your brain differently than typing does) should have no problem using this. I’m a staunch pen-and-paper user—and had even switched to fountain pens in the year leading up to trying out the Boogie Board—but I was quickly sold on the experience of writing on a Boogie Board. Having that ongoing archive of all of my notes that’s not restricted by the notebook’s page count is a dream come true. And at only $80 on Amazon, the Boogie Board is already well on its way to paying for itself. Even if I didn’t value the time I spend looking for my current notebook amidst a stack of used ones and looking through older notebooks to find a particular note, I’d make up the $80 in just a couple months by no longer buying Moleskines, pens and legal pads. As an added bonus, you can also use your Boogie Board Sync as a pen-style mouse for your computer (like a downmarket Wacom tablet) or you can use it to turn your computer or smartphone into a virtual whiteboard. Evernote is good enough at doing a lot of things, but the only thing Evernote is actually great at is holding on to a whole bunch of stuff and letting you get to it from anywhere. The process of actually entering, categorizing, tagging and sorting through all of that stuff can be a chore. The most visible genius of the Boogie Board Sync is the freedom it offers through its great pen-on-e-ink interface. But just as genius is the way the Boogie Board Sync leverages that interface to take advantage of Evernote’s biggest strength without subjecting you to some of Evernote’s biggest weaknesses. By allowing you to still act like you’re using pen on paper, the Boogie Board doesn’t force you to adapt to a whole new way of producing and storing information. Digital technology is finally adapting to you, rather than asking you to adapt to it. The Boogie Board Sync’s sync system is good when it should be great. The device allows you to automatically download your sketches and notes to your computer or smartphone and then automatically dump the downloaded pages into Evernote, but you need to keep the Boogie Board App open for those processes to run. The option to run all of those processes in the background rather than staying parked on the Boogie Board app would be an improvement. An option to streamline the process even further and save storage space by having the sync app skip local storage and copy the files on my Boogie Board straight into Evernote would be even better. But what would really make the Boogie Board Sync a must-have for everyone who has been reluctant to loosen their grip on pen and paper would be grouping pages written in quick succession into single notes when uploading to Evernote. At the moment, your Boogie Board pages all go into the same notebook, but each page is its own note within that notebook. For students taking notes in class, professionals hopping from meeting to meeting or journalers scribbling down their thoughts on a subway ride, lumping together pages produced in quick succession would probably save time and stress. Adding this clock functionality could mean adding hardware as well as firmware, which could mean increasing the price or shortening its week-long battery life, but that extra little courtesy to the user could go a long way toward building good will. The Boogie Board doesn’t need to be in everybody’s hands yet, but it should at least be on everybody’s radar. I’ve been using mine for a month to journal, take notes at meetings, sketch design concepts and conduct interviews. Every time I pull it out, I get the same reaction: “What is that?” No one who has seen it has heard of it before. That needs to change. 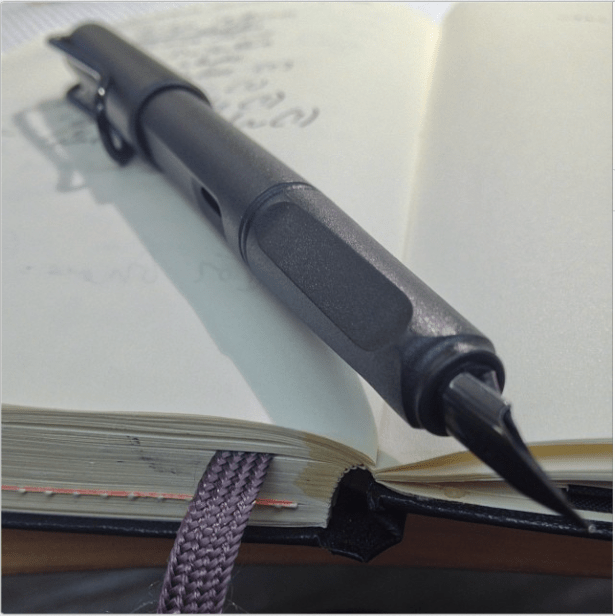 Techies, productivity nerds, journaling fanatics and creative professionals: This device is ready to go and will suit your needs. I can’t see any reason for you to not have already placed an order for one. This is potentially a game-changer for you—and at the very least it’s already a paper-saver. We’ve always known that smart pens and Evernote’s branded Moleskine are really just half-measures in our attempts to marry the best parts of analogue and digital, but the Boogie Board Sync finally gives us something better to measure them against. This should be the foundation for the way people bridge digital convenience and analogue flexibility. Improv Electronics has plainly been refining the idea behind its Boogie Boards over several iterations. It has improved rapidly, and I’m excited about the direction in which they are moving. In just four years, Boogie Boards have gone from glorified Etch-a-Sketches to the gift from the future that is the Boogie Board Sync. Their ambitions for the technology are clearly aimed in the right direction—we just don’t get much articulation of their long-term goals for the technology from any of their marketing or PR. I’ll probably do another post taking a look at the way they describe their products publicly versus messaging that would position them for faster adoption some time soon. In the mean time, though, here’s hoping Improv Electronics can step up their marketing and PR, because you really shouldn’t have needed me to explain what something this good is. PrevPreviousUgh! Seriously? Enough With The Photoshop Already!